Over 50 people joined a lobby of Coventry Council’s first full meeting since being elected on May 7th. The lobby, organised by campaigners from Save Coventry Libraries, saw a petition of over 2200 signatures against the closure of Tile Hill Library handed in by TUSC candidate Sarah Smith. A number of staff members and service users from the Employment Support Service (TESS) also attended the protest, and spoke passionately about the support TESS provides, both in helping disabled people find employment and giving ongoing assistance at work. Coventry Unison members also attended to show support to members of the community fighting to defend local services. A number of councillors passed the protesters and some even stopped to listen to what we had to say – unfortunately Foleshill’s Abdul Khan was not one of them, and dismissed service users by stating that TESS “isn’t [his] portfolio”. Despite repeatedly being asked to oppose cuts, none of the councillors committed to voting against further austerity measures proposed by the Labour council. 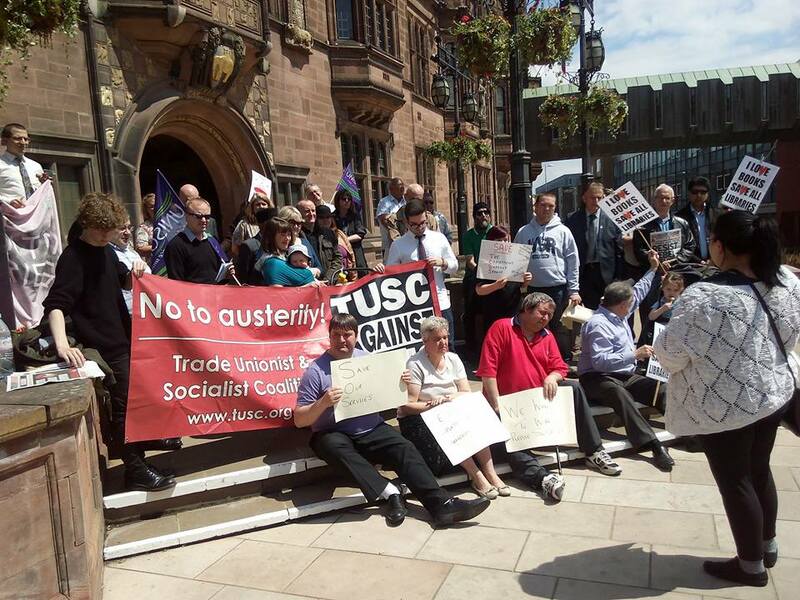 Many speakers pointed out that one lobby of the council won’t force them to back down, and further action will be needed, such as the protest against Osborne’s austerity budget on July 8th (5.30pm at Broadgate in Coventry). One campaigner stated that if the councillors we’ve got won’t fight back, at the next election we should replace them with some who will. Lobby Coventry Council – save our services!